I’m not a big football fan, but I do enjoy watching games of my national team with a group of friends. But the most fun is to paint my nails in the national colours! 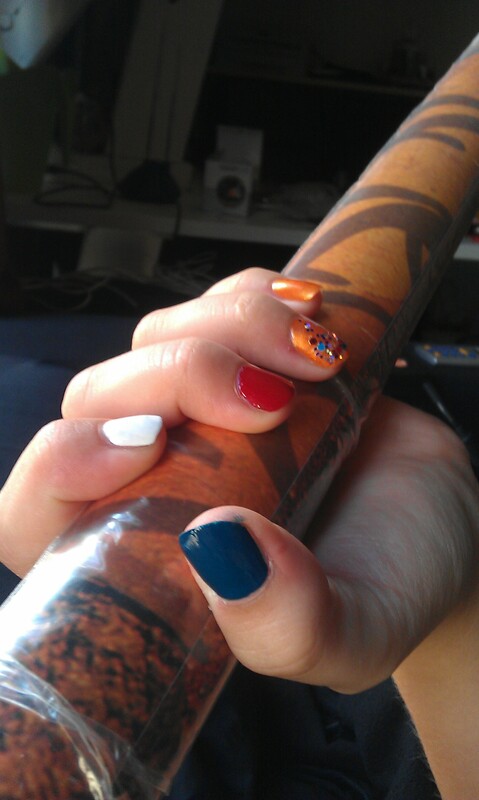 Since I’m a Dutchie, I went all out with red, white, blue and orange! 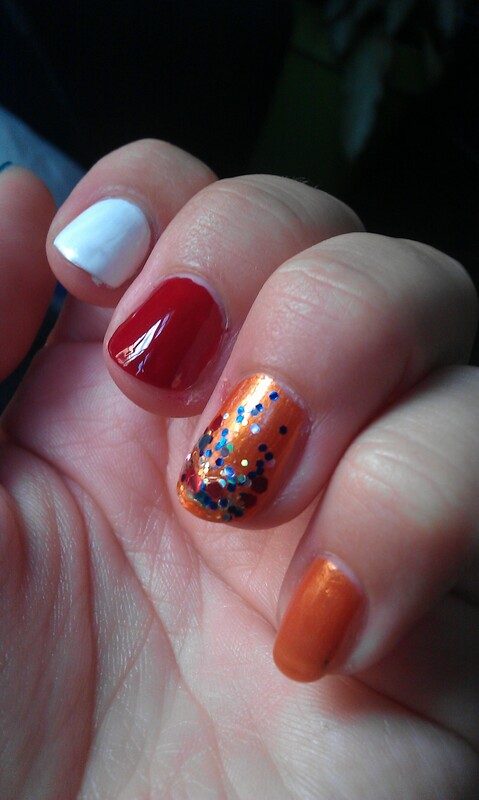 Blue: Rimmel 844 Out Of The Blue; white: Rimmel 703 White Hot Love; red (over white): Hema Longlasting 185; orange: Max (action) rainbow set. For the accent nail (if you can call it such, since all nails are different!) I topped the orange with a multicolour glitter polish (Milano Alternative Design M08, bought at the Wibra for 1.29) which has red, silver, blue and gold/orange glitters! I’ve worn this mani since Friday (it’s Sunday as I’m writing this) and it’s holding quite well! Even without top coat, because I forgot to bring it.. The blue had some tip wear but that was easy to touch up. I had to redo the ring finger of my right hand because I picked at the glitters too much 😦 but, with those touch-ups, I’m hoping to wear this until the next match on Wednesday! Have you wathed any of the World Cup matches yet? Who are you supporting and did you do anything special? Ps. I wrote this from my phone, please tell me if you spot any typos or if the lay out is messed up! I haven’t watched all the matches yet, but I really enjoyed watching the Netherlands beating Spain 😀 It was so fun to watch even though I felt a bit sorry for Spain as well. Yeah I guess it was quite humiliating 😦 I just wanted to give the goalie a big hug, because even though he made some mistakes it really wasn’t his fault! I’m a goalie too sometimes (in a different sport but it’s still all the same :P) so I could feel his pain..
Yess, Spain’s keeper looked like a sad puppy! I hope they’ll do better next time. Haha, mijn vriend heet ook Kuiper, vandaar dat het ook direct in mn oog sprong! Ach, het maakt allemaal niet heel veel uit. Maar toch hoop ik op winst!